BINGHAMTON, NY, May 11, 2012Â –Â McIntosh Laboratory, a global leader in home entertainment systems that has defined the highest quality in sound reproduction for over 60 years, is expanding its processor line with the debut of two high-performance A/V Control Centers, theÂ MX121Â (MSRP: $6,000) andÂ MX151Â (MSRP: $12,500). Designed to serve as ultimate-quality â€œnerve centersâ€ of total home entertainment systems, both units offer advanced features and functionality far beyond those of typical A/V preamplifiers. Both units feature the most sophisticated HD digital audio decoding and HDMI video switching, including 3D Video Pass-Through capability. Both the MX121 and MX151 offer advanced solutions for controlling all todayâ€™s advanced video and audio source components, offering users total ease-of-use, straightforward control and picture-perfect operation. The vast array of digital and analog inputs featured in both units can be custom labeled for simplified system operation and matched in volume level for a smooth transition between sources. Both feature built-in DolbyÂ® TrueHD and DTS-HD Master Audioâ„¢ decoding for the latest Blu-ray disc soundtracks. Two channel stereo source materials may be played back in stereo or processed up to a 7.1 multi-channel using Dolby Pro LogicÂ® IIx or DTS Neo:6 decoding. For added flexibility in multi-zone system building, both the MX121 and MX151 offer Dual Zone operation, allowing users to enjoy two audio / video zones of different media simultaneously in separate rooms with program selection and independent control. The MX121 A/V Control Center, part of McIntoshâ€™s new â€œHome Theater Bundle,â€ moves beyond the features and capabilities of the conventional Home Theater controller with a powerful suite of contemporary features geared toward todayâ€™s music lover. It sets high performance home theater with new standards, providing users with an elegant solution for controlling and enjoying the maximum benefits of todayâ€™s advanced video and audio source components. Notably, the unitâ€™s built-in wireless streaming feature allows for access of music from local network devices. Additionally, a wired USB input connection allows for music on portable devices to be played back with full size fidelity. To dramatically improve video performance, the MX121 features a robust up-converting video processing engine with advanced HDMIâ„¢ capability, ensuring that all non HD video sources are up converted to HDMI output and scaled at up to 1080P resolution. All of the latest audio video film formats are supported including 3D Pass-Through, as well as all legacy source formats such as VCR and even Laser Disk. Both the MX151 and MX121 carry on the McIntosh tradition of sonic excellence with exceedingly low noise and distortion performance. Two balanced inputs combine with balanced outputs and a differential balanced audio topology to offer superb low-level linearity. Coaxial and optical digital audio inputs are also provided. An on-screen user interface is menu-driven and intuitive for ease of system set up. 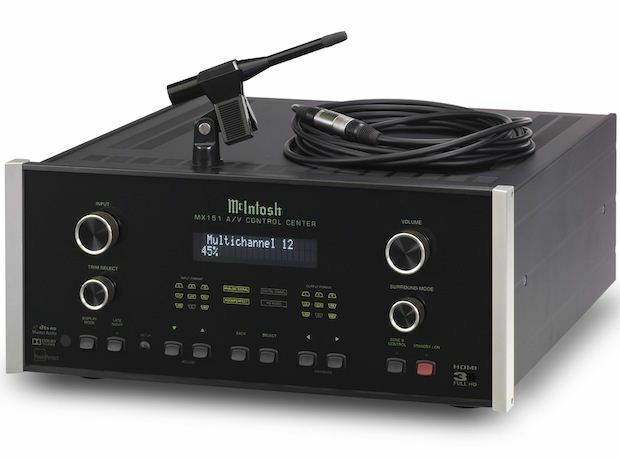 An RS232 input offers compatibility with third party remote control systems while McIntosh Power Control Ports enable both units to control an entire McIntosh system from a single hand-held remote. * ROOMPERFECT is a registered trademark and the ROOMPERFECT logo is a trademark of Lyngdorf Audio A/S. * DTS is a registered trademark and the DTS logos and Symbol are trademarks of DTS, Inc.
* Dolby and the Double D symbol are registered trademarks of Dolby Laboratories. HDMI, the HDMI Logo and High-Definition Multimedia Interface are trademarks or registered trademarks of HDMI Licensing LLC. Since 1949, McIntosh Laboratory has been committed to excellence, innovation and quality. McIntosh continues to define the ultimate home entertainment experience for discriminating consumers around the world. Handcrafted in Binghamton, New York, its products deliver powerful performance and superlative engineering. The iconic â€œMcIntosh Blueâ€ Watt Meters have become the recognized symbol of quality audio globally. McIntosh systems are created to share music quality passion throughout generations. McIntosh Laboratory, Inc. is a D&M Holdings company. For more information visitwww.mcintoshlabs.com, or join us on Facebook:Â www.facebook.com/mcintoshlabsÂ and Twitter@McIntoshLabsInc. All product and brand names with a trademark symbol are trademarks or registered trademarks of McIntosh Laboratory, Inc. All product and brand names with a trademark symbol are trademarks or registered trademarks of McIntosh Laboratory, Inc.